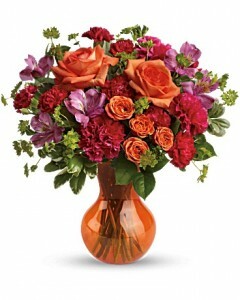 Juicy orange and fuchsia blooms are a fancy-fun way to celebrate that special someone. This beautiful bouquet of fresh, sherbet-hued flowers is presented in our orange Serendipity vase - a heartwarming gift all year long! Orange roses, pink alstroemeria, dark pink carnations and miniature red carnations are accented with fresh bupleurum, lemon leaf and variegated pittosporum. Delivered in a Serendipity vase. Send good feng shui someone's way with this striking arrangement. 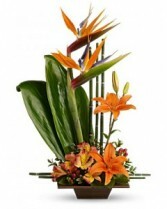 Orange flowers, gorgeous green ti leaves and small bamboo-like canes are arranged in a balanced, Zen-like composition. Asiatic lilies, alstroemeria and birds of paradise are accented with red hypericum, ti leaves, galax leaves, oregonia and bamboo-like equisetum. Delivered in a dark brown bamboo dish. 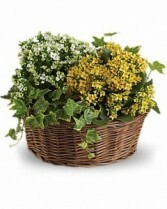 Send warm autumn sunshine to a special friend or relative with this golden gift basket of flowers. Yellow lilies and sunflowers make everyone smile! 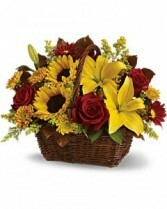 A dark, handled basket presents bright fall bouquet of yellow asiatic lilies, yellow sunflowers, gold cushion mums, burgundy daisies, yellow solidaster, brown copper beech leaves and rich green salal.